The music star has leapt to the top of the charts at the halfway stage of the week and could topple last week’s chart-topper The Greatest Showman soundtrack, according to the Official Charts Company. 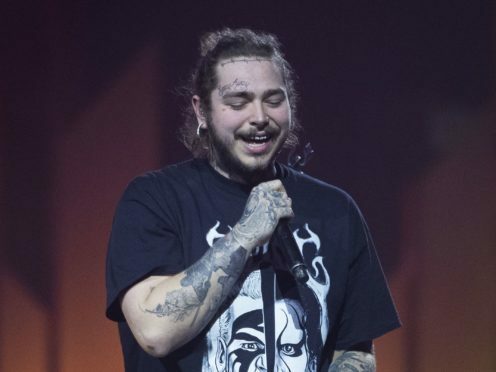 The Rockstar rapper’s new effort is the follow-up to his 2016 debut album Stoney, which peaked at number 10. Two of the tracks from Beerbongs & Bentleys are also set to claim the highest new entries on the singles chart, with Paranoid and Better Now currently placed at 10 and 11 respectively. The Greatest Showman, which has reigned supreme at the top of the Official Albums Chart for 14 non-consecutive weeks, has still managed to fend off the new album by rockers Blossoms, Cool Like You, which is in line to debut at number three. Singer-songwriter Anne-Marie’s debut album Speak Your Mind is close behind Blossoms at number four, while George Ezra’s Staying At Tamara’s retains its top five spot. American singer Janelle Monae looks set to score her first UK top 10 album with her third record Dirty Computer, currently at sixth place. Over on the Official Singles Chart, Calvin Harris and Dua Lipa are poised to land a third week at number one with their duet One Kiss. Pop star Ariana Grande is still in second position with new single No Tears Left To Cry, while rapper Drake’s Nice For What and Lil Dicky and Chris Brown’s Freaky Friday are both holding on to numbers three and four respectively. The fifth spot at the mid-way stage of the week is being held by Anne-Marie’s 2002, up from number eight last Friday.